E.H. Wachs FF Flange Facer series machine tools are based on the powerful and versatile SDB Small Diameter Beveler. 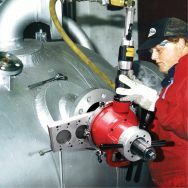 Easy to setup and operate by a single user, even an inexperienced one, the FF Flange Facers feature a quick change mandrel system for fast installation. Rugged yet lightweight, their compact design allows them to fit into the tighest quarters. Mounting to the pipe I.D. (Inside Diameter) they’re self centering, and the mounting legs require less than a 1 inch (25.4mm) straight area for mounting. Wachs FF Flange Facers produce a lathe-quality record groove, RMS 500, 250, 125 & 63 surface on flat, raised or recessed face flanges in minutes. Specify the SDB Small Diameter Beveler Conversion Kit to add beveling, facing and counterboring capabilities. Strong and versatile, E.H. Wachs SDB Small Diameter Beveler series is a line of handheld beveling and prepping machines that deliver maximum power and performance for fast and accurate end preps. 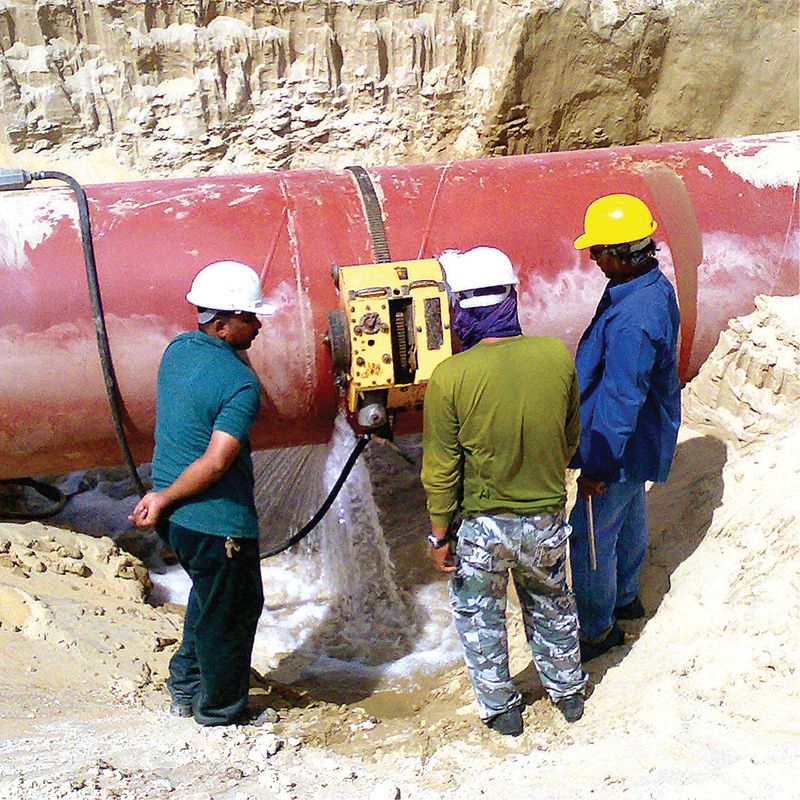 The SDB Small Diameter Bevelers create precision weld preps on pipe and tube from .875 inch - 12 inch (DN10 - DN300). With an SDB Small Diameter Beveler you can face, bevel, deburr, compound bevel and counter bore on carbon, stainless and high alloy steels, while benefiting from the versatility, durability, compact and lightweight design that typifies all E.H. Wachs equipment. Machine boiler tube, heavy wall pipe, thin wall stainless tubing, and prep elbows with the SDB line. The Wachs SpeedPrep EP 424 End Prep with the new AutoFeed system is a precision I.D. 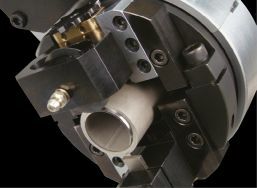 mount end prep machine tool designed to bevel, compound bevel, J prep, face and counterbore pipe, fittings and valves. Utilizing our revolutionary Speed Prep mechanism that feeds simultaneously in the axial and radial planes, the EP 424 is able to machine any bevel or compound bevel without templates, incline tool slides or work stoppages. With the AutoFeed system, it's now possible to set the bevel angle and land that works best for your application, all without work stoppages or additional stoppages. Powerful enough to form tool from 4 inch - 16 inch (DN100-400) through Schedule 160, it will single point from 4 inch - 24 inch (DN100-600) up to a 6.5 inch (165mm) wall thickness. 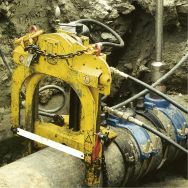 E.H. Wachs family of portable Guillotine pipe saws are designed to cold cut 2” through 32” (DN50-800) pipe, as well as solids such as bar stock, rails and beams. 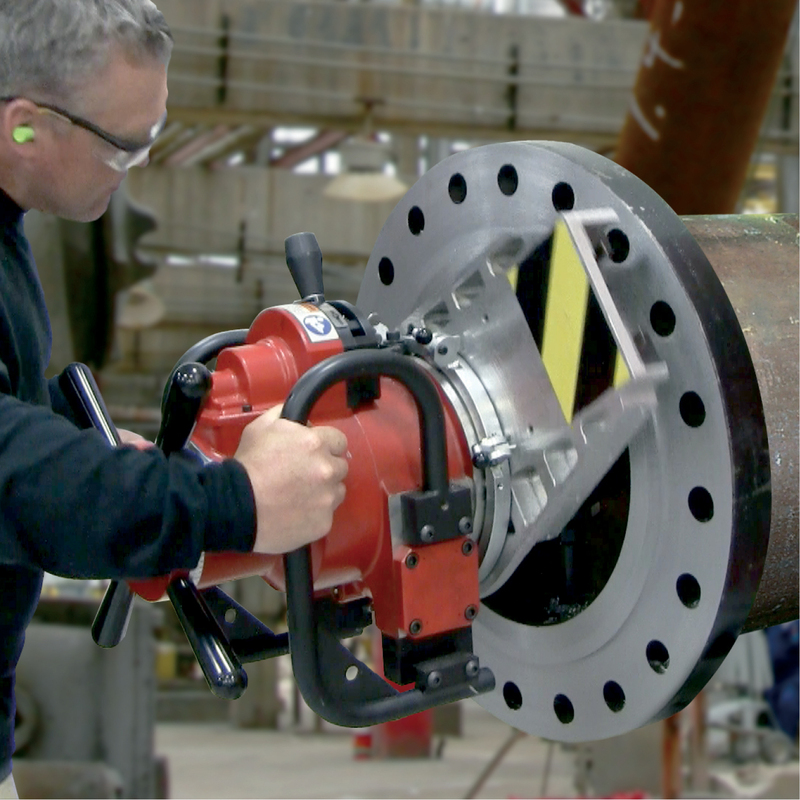 Their compact design and quick setup make it the ideal saw for contractors, pipeline operations, refineries, petrochemical and processing plants, and anywhere a fast, safe cut is needed. In use virtually everywhere, they’re strong yet light, simple to mount, simple to operate and simply bulletproof. The four Guillotine® models available, from smallest to largest, are the Super C, Model D, Super D and Goliath. All set up quickly with a positive chain mounting system that uses a machined cast iron “V” saddle for perfectly square cuts. Operation is easy with finger-tip feed control, and all use an orbital cutting motion that lifts the blade on the return stroke, dramatically extending blade life. From simple to difficult, pipe to solids, carbon to stainless, safe to hazardous, above water or below, whatever the cutting task Wachs has a Guillotine pipe saw for the job. When E.H. Wachs® is mentioned, the product that often comes to mind is our famous Trav-L-Cutter. 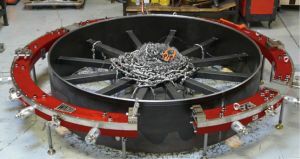 Secured to the pipe by a special tensioning/drive chain, the Trav-L-Cutter drives itself around the pipe as it simultaneously cuts and bevels, providing a machined surface ready for welding. 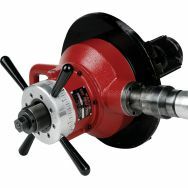 It's designed for severing and beveling all common pipe materials, wall thicknesses and sizes from 6 inch O.D. (DN150) on up. The Trav-L-Cutter® special milling blades, with standard weld bevel capabilities of 30 degree & 37.5 degree, remove .188 inch (4.8mm) of metal during operation, leaving the pipe ends with a fine milled finish and no heat affected zone (HAZ). Our best selling Model E uses a powerful pneumatic drive motor, and can be powered by most industrial air compressors. The Model HE utilizes a powerful, sealed closed loop hydraulic drive system, ideally suited for hostile environments or for use underwater. E. H. Wachs LDSF Large Diameter Split Frame with hydraulic drive is designed for cold cutting, beveling, facing and counterboring on large diameter pipes, vessels and flanges. It’s been engineered to incorporate multiple advancements designed to make it stronger and faster to set up and operate. Picking up where our MDSF split frames leave off, four standard LDSF Large Diameter Split Frame sizes will cover a range from 60in-120in O.D. (DN1500-DN3000). Each machine covers a 15in (381mm) diameter range and will simultaneously cut and bevel most wall thicknesses and materials. The internal, full bearing construction contributes to the LDSF Large Diameter Split Frame's smooth operation and long service life. Spring loaded O.D. (outside diameter) tracking slides for irregularly shaped or out-of-round pipe and vessels are standard, and allow the tooling to maintain continuous contact, producing precision weld preps with consistent lands. A new patent pending CRBM Counterboring and Reverse Bevel module counterbores in vertical orientation, and reverse bevels in angled orientation. The LDSF Large Diameter Split Frame takes corrosion protection to a new level with virtually every surface treated. Its attractive red powder coated finish proudly reflects E.H. Wachs corporate colors. 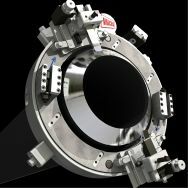 E.H. Wachs SDSF Small Diameter Split Frames are the smallest and most compact member of the Wachs split frame family of pipe cutters, and are designed for cutting, beveling and counterboring pipe and tubing from .5 inch - 6 inch O.D. (DN15-150). Like all our split frame, clamshell style machines the SDSF Small Diameter Split Frame is designed to “split” in half to fit over inline pipe, or can be slipped closed over open ended pipe. Six models are available in 1 inch (25.4mm) increments, with additional sizes available by special order. The SDSF is ideal anywhere pipe and tube are arrayed in tight places, such as pipe racks, and finds many uses in power generation, oil and gas and shipbuilding. The SDSF operates on air or electric power using standard Wachs motors and adaptors, and is part of a complete system that includes a broad range of tool slides and accessories for maximum versatility. As with all E.H. Wachs products, the Small Diameter Split Frame is built with our legendary quality and durability for years of reliable service. Our clients’ needs in cold cutting machine tools continue to change and evolve. As the innovators and market leader in split frame technology, E.H. Wachs continually evolves its products to meet those needs. You asked for split frames that were easier to set up, easier to operate, and more powerful to handle heavy wall form tooling. At the same time you didn’t want to change what made Wachs LCSF Low Clearance Split Frames great: their low clearance design that fits into tight spaces, its portability, and its wide range of versatile accessories. 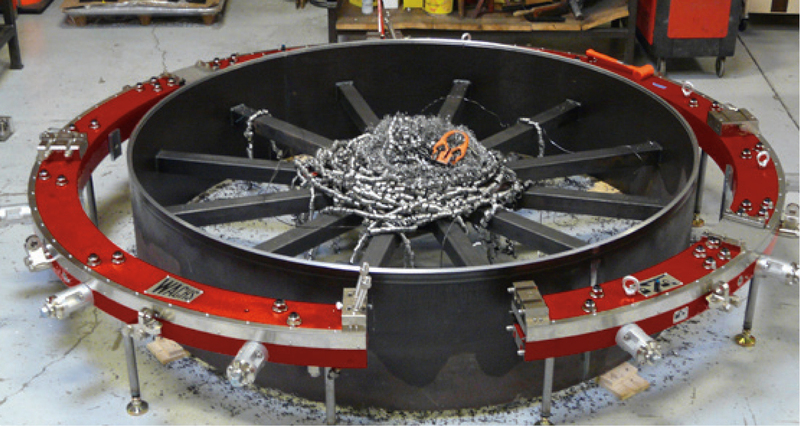 Designed to meet and exceed all these parameters, we designed the DynaPrep™ MDSF Split Frame. Engineered to surpass anything available today, it was benchmarked against the rest and built to be the best. In ancient Greece Dyna translated to power, at E.H. Wachs DynaPrep translates to maximum power in cold cutting weld prep machine tools. Our core design principal during its development was power combined with durability. Wachs DynaPrep MDSF split frame redefines the category of cold cutting machine tools for pipe and vessels. Rugged yet highly portable, DynaPrep offers unmatched form tooling capability on heavy wall pipe, including difficult to machine high alloy materials. Designed for cutting, beveling, facing, counterboring and flange facing, it's available in sixteen standard models for nominal pipe sizes ranging from 2in - 60in O.D. (DN50-1500), with each model covering a generous 6in range. Sold as complete kits or individual components, the DynaPrep MDSF is available in your choice of pneumatic, hydraulic or electric drive.